We're Pleased to Add an Extensive Fleet of Tandem & B-train Roll-Tites. Reduced manpower requirements: Once person can do in minutes what would take hours using a conventional, throw-on tarp. Increased operations safety: The entire system can be opened and closed from ground level, eliminating the risk of falling and the need for costly safety equipment. 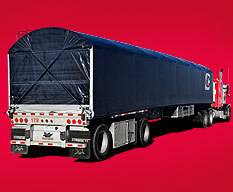 Lightweight and aerodynamic: Up to 30% lighter than competing, retractable tarpaulin systems (adding just over 1500 lbs to a 48’ flatbed trailer), Roll-Tite systems feature an aerodynamic headboard. Versatile: The Roll-Tite system compresses to only 8’ in length and can be positioned and locked to any location on the track, allowing ease of access to material on any part of the trailer. Quality construction: Only the highest quality aluminum and tarp materials are used – they are manufactured to strict quality standards. The Roll-Tite system reduces possible damage to your freight and transports your goods in a safe and secure environment. "Easier to load, easier to manage. Our expanded Roll-Tite fleet is ready to serve your exact requirements throughout North America."